I'm not sure about you, but writing all these scripts is putting me on Google Spreadsheet overload. With the release of the ability to access any of the AdWords reports, the data quickly starts to get unwieldy. Once things get over a few thousand rows, I much prefer to use Excel or store and manipulate data in a database. So I was looking for other ways to get data from an AdWords report out of the scripts world and I thought of Amazon S3. Amazon offers a RESTful API through their Amazon Web Services that allows you to store and retrieve large amounts of data from the cloud. I figured I could use them to store some CSV files of account/campaign/keyword performance for downloading or processing later, maybe by another script or software. The script below tries to encapsulate all the logic required to build and authorize a proper S3 put request. I followed the documentation found here. 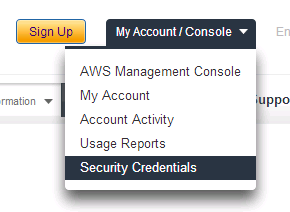 Next, create a new S3 bucket to hold all your data through the AWS console. Fill in the details below and try a test file. Ideally, you would combine this with one of the other AdWords reporting scripts found here to start storing your data in the cloud. NOTE: This is a very specific set of functions which represent the bare minimum required information to PUT a file to Amazon S3. For more information, please check out the full Amazon S3 Docs.